Dig deeper into what it means to step up and live a courageous life with Stepping Up Video Series. Based on his book by the same title, Dennis Rainey, along with Matt Chandler, Bill Bennett, Robert Lewis, Voddie Baucham, Stu Weber, James MacDonald, Joshua Harris, Eric Metaxas, Crawford Loritts, and other ministry leaders unpack what biblical manhood looks like and what it means to be a godly, courageous man in today's world. Through engaging stories, expert teaching, humorous vignettes, man-on-the-street interviews, and personal insights, these men's ministry leaders call every man to become courageous leaders in their own lives, marriages, churches, and communities. Accompanied by small-group discussion and individual follow-up exercises, men of every age will learn action tools for gospel-centered living to empower them to be true heroes in their families and communities. Essential for the small-group study experience, the workbook correlates to the 10 video sessions and provides additional thought-provoking content, small-group discussion questions, and three days of follow-up exercises for men to finish on their own. 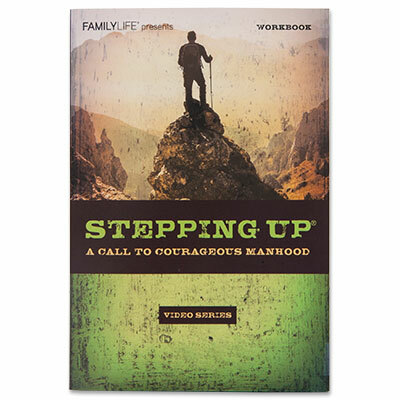 As they progress through the study, men will also capture a few key thoughts from each session that will comprise a Stepping Up Plan-a personal action plan to keep them focused on "stepping up" to manhood. For men who desire further study, additional readings from the Stepping Up book are suggested in "Read More About It" sections. Learn more about the Leader Kit. For convenience a Study Set (a workbook/hardcover book combo) is also available. 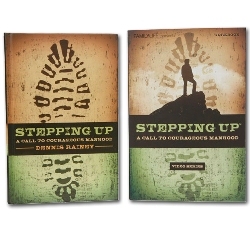 Save when you purchase a Stepping Up Video Series Workbook together with the Stepping Up Hardcover. Save 10% when you purchase a case quantity of the Stepping Up 10-Week Video Series Workbook! Tim Grissom is a writer living in Little Rock, Arkansas, where he also serves as senior editor for FamilyLife Publishing®. He is the author of numerous articles, has contributed to several books, and is the coauthor of the best-selling book, Seeking Him. Tim loves to help people understand how deeply the Bible speaks to the issues of life and to encourage them to find their rest in God.